The City of Northfield installed the first Way-Finding Signage yesterday. I’m hardly an unbiased opinion but I think that it looks great. I’m just so pleased to see it. It’s the first of what is supposed to be a number of way-finding signs installed in and just out of downtown. Last year, a test model was erected temporarily but this one is intended to provide years of service. 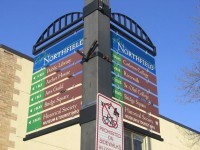 The signs provide directions to the major sites and attractions in Northfield as well as the location of the public restrooms. The overall plan (developed by City staff and Neuger Communications Group, through a number of public input gathering sessions over the past year or so) is to help visitors move into and around Northfield. It’s really exciting, now that the snow is gone, to see some of the many projects begin. I think that projects of this more modest scale can really add up to make a big difference in our community. Pingback: Northfield Downtown Development Corporation » Weblog » Way-finding Sign Returns!